John Deere manufactures various lawn mowers and lawn tractors. Most John Deere equipment is made of high-quality parts and rarely breaks down. Older John Deere lawn tractors not properly maintained will occasionally have problems starting. There can be various things that can cause the starter on the lawn tractor to not work. 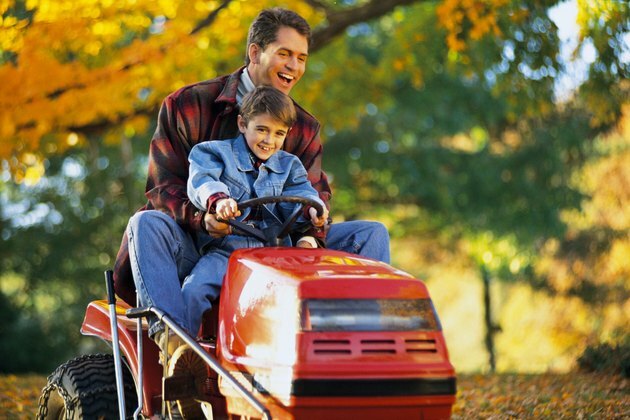 After fixing your lawn tractor you can go back to enjoying it. Make sure the battery connector is tight and not loose. If the connector is loose, you can use a wrench to tighten it back up. If the battery connector is corroded, you must replace the battery connectors. Remove each fuse and place it into the "Fuse Check" slot. If you hear an audible beep, then the fuse is good. If the fuse is bad replace it with the same type of fuse. Check the electrolyte level on the battery. Use the screwdriver to pry open the battery lid. If you cannot see the water, add distilled water to the battery. Inspect the PTO (power take-offs). Make sure nothing is blocking the PTO, and it is not engaged. Put the gear shift lever in gear. The John Deere tractor will only turn on in gear. Inspect the start switch. If it is damaged it must be replaced.